More and more, utilities are choosing demand response (DR) as a way to balance grid operations, lower energy prices for consumers, and integrate renewable resources like solar power. 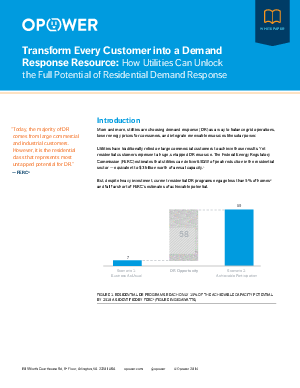 Utilities have traditionally relied on large commercial customers to achieve those results. Yet residential customers represent a huge, untapped DR resource. The Federal Energy Regulatory Commission (FERC) estimates that utilities can deliver 65GW of peak reduction in the residential sector — equivalent to $3 billion worth of annual capacity. But, despite heavy investment, current residential DR programs engage less than 5% of homes and fall far short of FERC’s estimates of achievable potential.